When people talk about having a second childhood, I don’t think this is exactly what they mean, but before long, everything I obsessed over as a child is going to be back in full effect. We’re already neck deep in Transformers and G.I. Joe franchises, The A-Team has come around again, Knight Rider is on the way, and Red Dawn and RoboCop both made me sad. 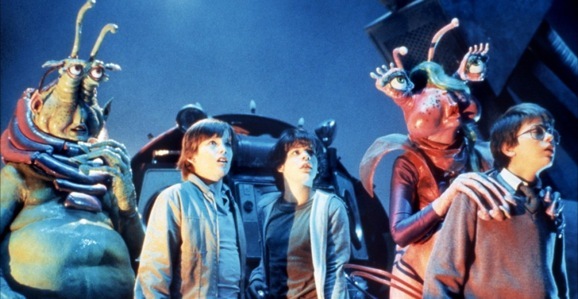 Those are just the ones I can think of off the top of my head, but we’re about add one more to this list, because Joe Dante’s 1985 sci-fi classic Explorers. Directed by Joe Dante of Gremlins and The Howling fame—also key pieces of my youth—Explorers was a flop in the theaters, but grew to bona-fide cult status once it hit home video. The third act is a strange mess, largely because they kind of made it up as they went, due to money issues. The film tells the story of three young friends—played by River Phoenix and Ethan Hawke, both making their big screen debuts, and Jason Presson, who no one has heard from since—who take an old Tilt-A-Whirl and turn it into a fully functional spaceship in their back yard. And their craft is named Thunder Road, which is pretty badass. Mission Impossible: Ghost Protocol writers Andre Nemec and Josh Appelbaum will produce the new Explorers for Insurge, the low-budget arm of Paramount. Geoff Moore and Dave Posamentier, the writer/director team behind the upcoming Better Living Through Chemistry, have been hired to write the script, though not to direct, at least not at this point. Beyond that, there’s not much else in the way of details for the remake. We can assume it will probably involve some young, or at least youngish, kids venturing into space, hopefully in some homemade contraption. Part of the reason I loved Explorers—which is streaming on Netflix by the way— as much as I did is because it is one of those rare movies where the kids get to be the heroes. And I don’t just mean the focus, there are lots of movies like that, but movies like Goonies, Monster Squad, and Red Dawn put the weight on the young stars. These were movies where the kids had to save the day; the parents or other adults didn’t swoop in at the last minute and make everything okay. They gave us whippersnappers credit for being smart, strong, and capable in a way most movies didn’t and still don’t. Let’s hope the new version keeps that spirit alive. I have the faintest glimmer of hope due to the low-budget nature of the production. If nothing else that means this isn’t going to be a big, empty, special effects driven remake. Hopefully that means they’ll have to rely on a telling a good story with compelling characters, though I’m sure they’ll find new and inventive ways to bastardize another cherished piece of our collective childhood. This remake could fill my pockets with gold every time I watch it and it still would not be as good as the original. At least it’s not about a tornado of sharks.